“ If I am not for myself, then who will be for me? And if I am for myself only, then what am I? 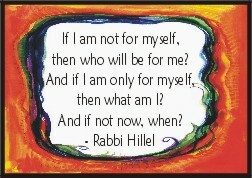 This is a well known quote by Rabbi Hillel (110BCE- 10AD) a famous Jewish figure and religious leader. These words challenge us when we must decide what is the “right” thing to do or say. Do you ask for what you want? Should you do that or not? If you do, will you be wrong, selfish, uncaring? Standing up for what you want and believe can be really tough especially when you feel in any way vulnerable or unsure. HOW you speak or act for yourself or others can be as important as your words or deeds. Assertiveness is not about being right but about speaking your truth and taking ownership for it. Beginning with “I” to state your thoughts or feelings is a central principle of assertiveness. Being careful not to blame others is also important. Assertiveness is an “inside” job- You must believe you are worthy enough to have an opinion and express yourself. When you feel safe enough within yourself, your words and actions can be expressed with a calm certainty and not with anger or defensiveness. This is surely a strength that requires lots of practice. The second part of the quote,( “And if I am for myself only, then what am I?”) implores you to keep in mind that focus only on yourself and what you want can limit your life and your potential. Everything that happens to you is not always about you. When we feel hurt or deprived , we are more likely to close ourselves off. When we are so self -focused and preoccupied with ourselves, we push others away. The bubble of self -concern can be very lonely. When our mirror is always focused on ourselves, we cannot have any real meaningful connections or see the true reflection of others. Finding the balance between self- concern and others’ needs is a life long challenge . The final phrase, ( “If not now, when?”) speaks to how often we avoid confronting what is difficult and risky. Procrastination has been said to be fear of failure. The belief behind avoiding taking a risk is “ If I don’t try, then I can’t fail! “ We must all ask ourselves, what am I afraid of happening if I take that stand?” Although it can be wise to take time to reflect before you act, how often do you put aside or avoid doing what you need to do NOW? Taking that first small step is usually the only way to begin. Clearly Rabbi Hillel presented a challenge centuries ago that still is as relevant as when it was written. There are no easy answers to these difficult questions, but only the willingness to self -reflect and try to lead your life with personal meaning. Finding balance in how much you focus on yourselves and others and how you take action to live with purpose is a life- long and never ending journey. Such wonderful words to live by to and to remind each of us to take time to reflect! So pleased these words resonated with you.Take care.